Prelief Reviews - Is It a Scam or Legit? The calcium glycerophosphate found in each caplet of Prelief can help meaningfully reduce food-related acid flare-ups, according to the supplement’s website. Formulated with just two ingredients, Prelief is a drug-free dietary supplement that promises to safely and effectively reduce up to 95% of acid from top trigger foods and beverages, allowing you to enjoy your favorite meals without flare-ups. Since the supplement works on food (not on the body), the website advertises you simply need to take two to three caplets with each meal, snack, or beverage. In addition, we’re told Prelief delivers about 6.4% of your recommended daily intake (RDI) for calcium. As a company, Prelief is manufactured by DSE Healthcare Solutions (originally developed by AkPharma Inc.), an Edison, NJ-based company who’s been in business since 2006. They weren’t listed with the Better Business Bureau, although they manufacture other popular dietary supplements like Urinzonic and Charco Caps. If you frequently experience bladder discomfort, digestive discomfort, or other food acid problems, can you realistically expect the Prelief dietary supplement to address food acid problems before they rear their ugly head? That’s the primary question we’ll help you answer in this brief article. In layman’s terms, the physical sensation of heartburn is a common symptom caused by acid reflux into the esophagus. And if this acid reflux and resultant heartburn occurs often enough, your doctor might diagnose you with a condition known as gastroesophageal reflux disease, or GERD. In many instances, they explain that you can address acid reflux and GERD by making lifestyle changes, like losing weight, eating smaller meals, and avoiding certain ‘trigger’ foods; especially those that are fried, or heavy with chocolate or peppermint. Other examples outlined (among many) on the Prelief website include nearly all fruit juices, applesauce, beer, bread and butter, coffee, gelatin, honey, raisins, soy sauce, sweet relish, tuna, and yogurt. Also, it’s a good idea to avoid alcohol and nicotine. If lifestyle changes don’t sufficiently address the issue, they point out that you can occasionally use over-the-counter medications like antacids (e.g., Tums), H-2-receptor blockers or famotidine (Tagamet HB, Pepcid AC), or proton pump inhibitors (Prilosec OTC). What about Prelief’s specific formulation? Is there clinical evidence indicating it will provide meaningful relief from acidic foods? While Prelief offers caplet and Stir-In versions, according to the supplement facts label, each dose contains only two ingredients: calcium glycerophosphate and magnesium stearate. How Much Does Prelief Cost and Where Can You Buy? Regardless of where you buy, all Prelief purchases come with a 30-day money back guarantee from the manufacturer. The website indicates you’ll need to send them a copy of your cash register receipt and UPC code, along with your full name and address, and they’ll send you a refund for your purchase price. To initiate the process, you’ll need to call customer support at (800) 214-2379. What Can We Learn from Prelief Customer Reviews? Between Amazon and WebMD, we encountered more than 900 customer reviews for Prelief’s supplement, who had cumulatively given it an average rating of about 4.6 stars. Common compliments tended to reference effectiveness at reducing acid-related flare-ups, as well as symptoms related to interstitial cystitis, along with competitive price. On the other hand, the relatively few complaints frequently related to no results. 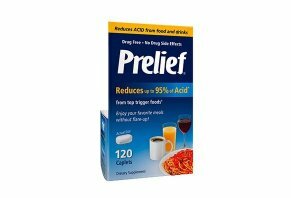 Are There Other Acid Reflux Supplements Competing With Prelief? While we didn’t encounter any other dietary supplements specifically marketed toward the cessation of acid reflux (remember, though, Prelief’s manufacturer technically doesn’t make this claim, either), we did come across several others promising to provide relief from the side effects it causes, such as heartburn and nausea. During our research, we even encountered generic calcium glycerophosphate supplements for as little as $16 per 120-capsule bottle. And this is to say nothing of common over-the-counter antacid medications like Tums (calcium carbonate), baking soda (sodium bicarbonate), Prilosec (omeprazole), Zantac (ranitidine hydrochloride), and Pepcid (famotidine). Given all of these different formulations and price points, how can you make the most informed decision possible? It might largely come down to which option works best for your individual symptoms—with the help of your primary care physician, of course. How so? Geek.com points out that if you’re especially susceptible to diarrhea, you might want to avoid products containing magnesium, while those suffering from constipation might be wary of antacids containing aluminum. Outside of this, interviewed for a Health.com article, Mitchell Cappell, MD, Ph.D., chief of gastroenterology at Beaumont Hospital in Royal Oak, Michigan, points out that antacids like these have been around for decades, are relatively inexpensive, work quickly, and are typically effective for relieving reflux-related heartburn. You can also take them long-term, and there often aren't many side effects, "But you have to take a lot of antacids because they are not as powerful as other heartburn remedies," he emphasizes. As a result, if you're experiencing ongoing (or especially painful) heartburn, you'll certainly want to speak with your doctor about exploring potentially stronger remedies. In the meantime, what should you do when it comes to Prelief? Will Prelief Address Your Acid Reflux & Heartburn? The bottom line is that Prelief comes from a company with many years in business, and who stands behind their supplement with a 30-day refund policy, regardless of the retailer you purchase from. On top of this, it comes with an overwhelmingly positive online customer reputation. Just remember that frequent or especially painful heartburn could be an indication of more severe health concerns. So, if this is something you’re experiencing, be sure to make an appointment with your doctor. And while you’re there, inquire about whether or not a calcium glycerophosphate antacid supplement like Prelief might provide meaningful relief, based on your specific diagnosis. Write a Review for Prelief!